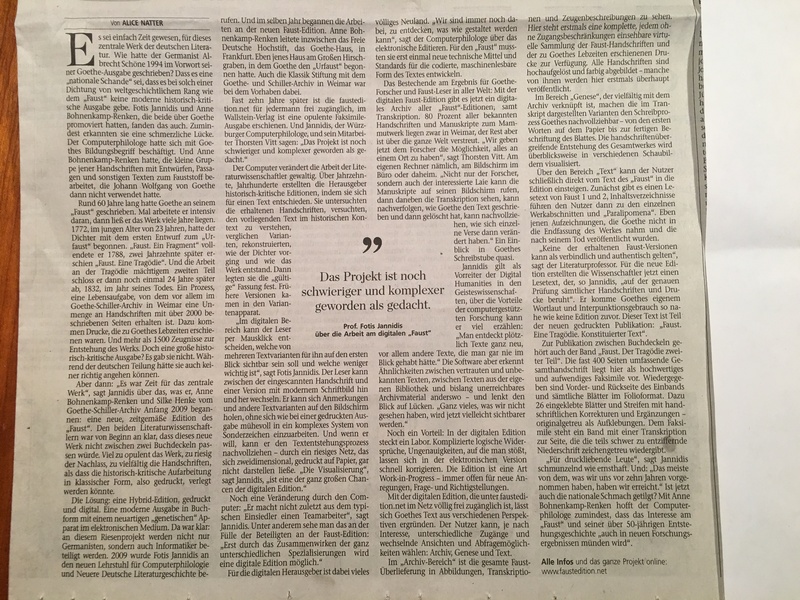 Here is an article, coming from the 'Mainpost', a newspaper in Würzburg/Germany I would like to share with you. It is a very interesting project about Goethe and his 'Faust'. What do you think about an adaptation of such a project to Tolkien? It would be fantastic to scroll though his own handwritten sheets, don't you think? Who do you think would be able to realize such a task - the Tolkien Estate or the Bodlian? It took almost ten years of work for this project: the complete „Faust„ edited digitally. Now anybody ist able to look at 2000 Pages handwritten and 1500 other tetstemonia. Fotis Jannidis the Computer-philologist in Würzburg hat the leading part. It simply was about time for this central oevre of german literature. How did the Germanist Albrecht Schöne in 1994 say in the introduction of his Goethe-Edition? That it was an „ national disgrace“, that there existed no modern historic-critical Edition of a Poetry of worlhistoric meaning as „ Faust“ was. Fotis Jannidis and Anne Bohnenkamp-Renken who did their doctorate on Goethe thougt the same way. At least they condidered it a painfull gap. The Computer-philologist had worked on Goethe‘s concept of education and Anne Bohnenkamp-Renken used the litte Collection of handwritings with drafts, passages and other texts about Faust that Goethe did not finally put into his work. Goethe had worked about 60 years on his Faust, he hat times of intense writing alterning with periods of years when he completely paused on it. In 1772 being in his younger years of 23, he started the first draft of the „Ur-Faust“. He finished on „ Faust.A Fragment“ in 1788 and two centuries later „ Faust. A Tragedy“ was released. The work on the Tragedy the powerful second part was finished 24 years later in the year he died, 1832. 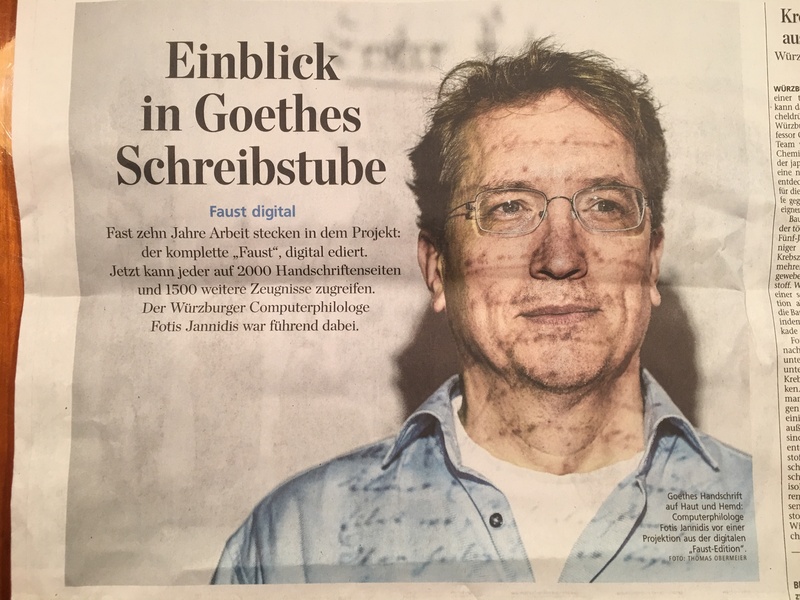 But then: „It was past time for that oevre of central meaning“ , Jannidis says about what he and Anne Bohnenkamp-Renken and Silke Henke of the Goethe-Schiller-archives had started in 2009: A new and contemporary edition of „Faust“. Both literary scholars knew right from the start, that it could not be put inbetween two boards. Too opulent the oevre, too huge the literary remains , too manifold the handwritings for this historical-critical workup to be published in classical aka printed way. The solution was: a “hybrid edition “, printed and digital. A modern edition in a book and a novel “ genetic” apparatus in an electronical medium. It was perfectly clear: this huge project could not be managed only by germanists, but also computer scientists were needed. In 2009 Fotis Jannidis was appointed to the newly created professorship of Computer-Philology and recent German literary history. The same year the work on the new Faust- edition started. In the meanwhile Anne Bohnenkamp-Renken started directing the “ Freie Deutsche Hochstift”, the “ Goethe- House” in Frankfurt. The very house at the “ Große Hirschgraben” where Goethe started with “Ur-Faust”. And the also “Klassik Foundation” including the Goethe-Schiller- archives at Weimar took part in this project. Almost ten years later the www.faustedition.net is freely accessible by anyone. And an opulent facsimile edition was published at the Wallstein publishing house. Computers change the work of literary scholars in a dramatic way. Over decades and centuries publishers released historical-critical editions in deciding a specific text. They investigated preserved handwritings, trying to understand this text in historical contexts , compared variations, tracing back how the poet approached the issue and how the work came to be. Then they determined the “ valid” version. The earlier editions were put to a collection of versions. “ in the digital context the reader can decide by clicking his mouse, which version of several variants of the text he wants to see in the first view and which of those are less important to him.” says Fotis Jannidis. The reader can switch between the scanned handwritings and a version in modern typeface back and forth. He is able to get remarks and other varieties of the text on his screen, without beeing forced to work on a complex system of special characters to understand. And if he wants he can retrace the genesis of the text by using a huge net of information, that could never be displayed in two-dimensinal printings on paper. “This visualisation “ Jannidis says “ is one of the immense opportunities of the digital edition “. Lots of issues were completely unknown territories to those digital publishers.” Still we discover things and how they can be arranged” the computer- philologst says about electronical publishing. For this “Faust” new technical standards and means for the coding and machine-readable texts had to be developed. Now this is the first digital archive of all Faust editions including transcriptions. 80 percent of all known handwritings and manuscripts of this gigantic oevre are situated in Weimar, the rest is spread all over the world. “ Now we offer every scientist the opportunity to find it at only one place.” Says Thorsten Witt. On his own computer workplace, on his screen in the office or at home. “ Not only for scientists, but also for interested laypersons the manuscripts can be put to his screen, see the transcripts and can follow up how Goethe wrote his text and extinguished it again, an he can also see how verses were changed.” A close view right into Goethe’ s wrinting chamber..
“ you are able to suddenly discover texts anew, especially other texts you never would have had in view”. But the software recognises similarities between familiar and unknown texts, between texts of your own library and so far inaccessible archives materials somewhere else. And it focusses your view to gaps. “ Lots of things we did not see so far, will now be visible. Another advantage: there is a “laboratory” in the digital edition. Complicated logical inconsistencies, inaccuracies you find, can quickly be corrected in the electronic version. The edition is a “work-in -progress” , always open to ideas, leading questions and adjustments. With this digital edition you can find unter www.faustedition.net, (free accessible) you can examine Goethe’s text from various perspectives. The user is able , referring to his interrest, to use different accesses, changing views and query options: archive , genesis and text. In the “ archive-area” the complete heritage in depiction, transscipts and witness testimonies can be seen. This is the first time, a completely free accessible, virtual collection of all Faust handwritings and in Goethe’ s lifetime released prints, is offered. All handwritings are visible: coloured and in high-resolution , some of them for the first time ever. In the “ genesis-area” which ist in many ways connectetd to the archives, your can follow up the process of Goethe writing, by using the transcript versions right from the first words until the final inscription on the sheet. The comprehensive genesis of the complete work ist displayed and visualised on various tabloids. In the “ text-area” the user is finally able to directly switch from the text into the edition. At first there is a reading text of Faust 1 and Faust 2 , a register of contents leads the user to the single sections of the work and to those “ Paralipomena”. Even these scripts that Goethe did not use for his final version and that were published posthumous. “ none of the sustained Faust- versions can be regarded as mandatory or authentic “ the professor of literature says. For that new edition the scientists created a reading-text which , Jannidis says is “ based on exactly examined handwritings and prints” . It comes as close as possible to Goethes wording and use of punctuation, as no edition before did. This text is part of the new printed publication: “Faust. A Tragedy. Constituted Text”. As a part of this publication in between two boards comes the volume “ Faust.Part two of the tragedy”.This complete-handwriting comprising almost 400 pages is published as a high-quality and extravagant facsimile. It reproduces the front and rear boards of the book cover and all sheets in folio range. Completed by 26 sheets and strips displaying handwritten corrections and supplements true to original as gluing-on. This facsimile is assisted by a transcript, which helps decipher the crabbed letters, true to the original. Is the national disgrace now extinguished? Together with Anne Bohnenkamp-Renken , Jannidis hopes, that the interest in ”Faust” and its 50 Years of genesis “will now lead to new results in research “. This would really be an amazing thing to have for Tolkien's works. Although I have a feeling it might not be something the Estate would be keen on doing or letting happen, it would certainly be fantastic for scholars to be able to dig through Tolkien's drafts/notes without leaving the home. Thank you Marion for translating this for everyone!! Very interesting. IMHO, Not a chance the Estate would allow this for Tolkien, whilst his work can be monetised. They won't (necessarily*) even allow established scholars to make copies of manuscripts that they are writing books about (leading to errors in said works due to manual transcription). I have always found their unusually tight grip on the material a bit odd, but I guess it is a business. *I know this is the case for at least one major work, but may not be the case for all. "They won't (necessarily*) even allow established scholars to make copies of manuscripts that they are writing books about"
I know of many cases, including my own, where scholars are indeed "allowed" to make copies (photocopies, photographs, scans), and even cases, including my own, where the Estate has provided the copies themselves. Of course, it isn't surprising that the Estate doesn't extend either this courtesy or permission to everyone who wants to work with Tolkien's manuscripts, but it is simply wrong to give the impression that they are somehow either hoarding or hiding the manuscripts. Just look at all the works that have been published by scholars other than Christopher based on the MSS. "leading to errors in said works due to manual transcription"
As I well know from personal experience, having a copy of a Tolkien manuscript is no guarantee against making transcription errors; so again, it is simply wrong to portray this as the cause of such errors. My comment, which was qualified, was based in what I was told about a fairly major work (and the manuscripts are at Marquette). I specifically qualified it, as it is hearsay -- and certainly not personal experience. I do, however, completely believe it. As I well know from personal experience, having a copy of a Tolkien manuscript is no guarantee against making transcription errors; so again, it is simply wrong to portray this as the cause of such errors." I portrayed it as *a* cause of such errors. As usual you read what you choose to, by responding to *the* cause... I seem to remember this being your favourite trick in previous exchanges. However, I stand by my statement that I believe there is no chance of the Estate allowing this, whilst the material can be monetised (as is their right, as a business). You didn't respond to that. I'm not interested in debating that opinion (or any other) with you, Aelfwine. When daydreaming and wondering what could be done with Tolkien in the modern age I have imagined an online database that serves as an extension to a released product. Like with Stanley Kubrick's Napoleon which when Taschen released the original books there was an access card to an online database which is enormous. More than 16000 images, records, notes and various artifacts from Stanley's pre production. This style of online archive could work really well for Tolkien studies and open up research. "I understand that the Estate is interested in monetizing." What suggests that to you? If the Estate were truly "interested in monetizing" Tolkien's MSS, they wouldn't have donated them to the Bodleian, but instead would have sold them (as Tolkien himself did with the MSS of The Hobbit and The Lord of the Rings), or charged a fee for access to them. I see nothing to suggest that the Estate had or has any interest in the MSS other than in organizing and interpreting them, and in preserving them for posterity and for (serious) scholarly use. Anyways... don't know what this discussion is all about, but many literary estates do monetize everything, I never had the feeling with the Tolkien estate. In fact the opposite.